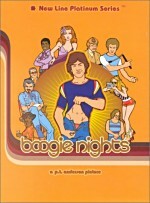 Boogie Nights appears in an aspect ratio of approximately 2.40:1 on this single-sided, double-layered DVD; the image has been enhanced for 16X9 monitors. This was a good but not great SD-DVD presentation. Sharpness seemed acceptable and often pretty strong, as close-ups looked fairly well-defined. Wider shots came across as iffier, though, a factor exacerbated by minor edge haloes. Still, the image was usually reasonably concise. Only minor signs of jaggies or shimmering occurred. Some mild digital artifacts popped up, but print flaws were essentially non-existent. With its 1970s setting, the flick opted for loud, borderline garish tones, and the DVD reproduced them in an adequate manner. Sometimes the colors looked pretty peppy, but some tones could seem too heavy – especially reds. Still, the hues mainly appeared reasonably good. Blacks were moderately deep, and shadows showed decent smoothness, though a few interiors looked a bit murky. Again, this never became a memorable presentation, but within the confines of SD-DVD, it worked acceptably well. Though not as good, the film’s Dolby Digital 5.1 soundtrack worked fine. The movie featured a soundfield oriented heavily toward the forward channels, where I heard excellent stereo separation for music, but general ambiance seemed less exciting. The mix used the rear speakers mainly for some minor reinforcement of the front channels - such as light applause during the award banquets – but that was about it. How did the SE DVD compare to the original DVD from 1998? Both seemed comparable. The SE may’ve been a little tighter, but I thought the pair shared a lot of similarities. The SE DVD mixes old and new extras, and we find two audio commentaries. 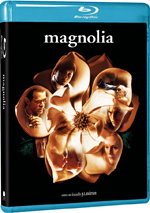 The first appeared on the original 1998 DVD, and it comes from director Paul Thomas Anderson. He delivers a running, screen-specific look at the project’s origins and development, inspirations, influences and research, story/characters, cast and performances, music, editing, studio/ratings issues, and a mix of other domains. The main problem stems from its looseness, as Anderson can be more than a little “stream of consciousness”. However, I enjoy his frankness and his willingness to avoid the usual commentary BS. We learn quite a lot about the film, so this become a very good discussion – it’s just not as amazing as I used to believe. 10 Deleted Scenes occupy a total of 29 minutes, nine seconds. The vast majority of these offer extended versions of existing segments. For example, we see more of the van ride early in the movie, and there's also more "coke talk" among Reed, Dirk and Todd. The cut sequences didn’t offer anything stunning, but they presented some interesting material. All of these snippets can be screened with their original audio or with commentary from Anderson, and they're fun either way. Anderson gives us details about the scenes as well as why they got the boot. More cut scenes appear in The John C. Reilly Files, which offers 15 minutes, 10 seconds of outtakes. Not surprisingly, all of these bits feature Reilly. Cast and Crew presents info for 16 actors and Anderson. These also add “biographies” for the movie’s characters, and that factor makes “C&C” more interesting than usual. Boogie Nights remains a flawed masterpiece, but it's a gem nonetheless. I like this movie more every time I see it, although its problems seem impossible to ignore. The DVD provides generally positive picture and audio with a mix of useful supplements. Boogie Nights remains a highly entertaining film.